� The Royal Australian College of General Practitioners 2012 All rights reserved. Requests for permission to reprint articles must be sent to permissions@racgp.org.au. Background: This article is facilitated by the Australian Cochrane Musculoskeletal Group (CMSG) editorial base. The CMSG is one of the largest Cochrane review groups and produces reliable, up-to-date systematic reviews of interventions for the prevention, treatment or rehabilitation of musculoskeletal disorders. 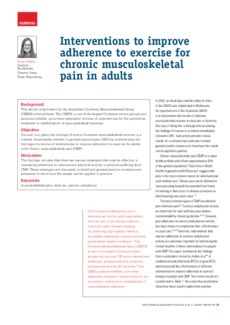 Objective: Our aim is to place the findings of recent Cochrane musculoskeletal reviews in a context immediately relevant to general practitioners (GPs) by summarising the findings of a review of interventions to improve adherence to exercise for adults with chronic musculoskeletal pain (CMP). Discussion: The findings indicate that there are various strategies that may be effective in increasing adherence to exercise and physical activity in patients suffering from CMP. These strategies are discussed in detail and general practice scenarios are presented to show how the results can be applied in practice.